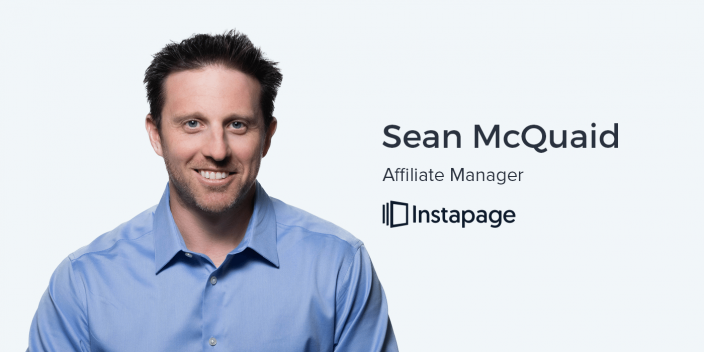 Sean McQuaid is the Affiliate Manager at Instapage. Since joining Instapage at the beginning of 2016, Sean has built the in-house affiliate program from the ground up. It is now a channel that drives a significant amount in annual revenue for Instapage. Previously Sean launched and scaled his own successful affiliate marketing business. He also has a background in sales. While many other acquisition channels have an unpredictable ROI, affiliate programs allow for direct ROI because they are based on direct performance. Even though you might be sacrificing some revenue to pay out commissions, it’s still a net positive gain for your business. Affiliate marketing is fairly common among eCommerce products and certain specific industries. However, it doesn’t have to be limited by the vertical you are operating in. There are many different ways to compensate affiliates. A longer sales cycle might benefit from an affiliate program that compensates affiliates based upon the leads they generate instead of sales. Marketing tools and SaaS products like Instapage are making it increasingly easier to be successful as an affiliate or get into the affiliate space. As affiliates become even more empowered to generate revenue for the companies they promote, and for themselves, affiliate marketing as an acqusition channel will become even more powerful for brands, businesses, and agencies. Ander: So, the last episode, we spoke with Patrick Holmes, our paid marketing manager here at Instapage. He runs all of our ads on Facebook, AdWords, and many other social platforms. I had so much fun doing that, and we got an interesting response from our audience. They really liked hearing about it as well. So, we are going to start featuring other influencers here at Instapage, and I figured we’d just do another one this week. I have Sean McQuaid here with me, our affiliate marketing manager here at Instapage. Really excited to have you here, Sean. Sean: Thanks, Ander. I’m excited to be here. You’ve done a great job building these podcasts, so I feel privileged to participate. Ander: Awesome. You are certainly in very, very good company. I think the best place to start, Sean, is the question… “what is affiliate?” What is this space that some of us might be familiar with, and others might not? Sean: That’s a really great question to start with. Affiliate marketing is a type of performance marketing, in which, on the one side, you have advertisers who are looking to achieve some type of marketing objective, some type of business goal. That could be lead generation. It could be sales. So, they create what we call “offers,” and they put those out there into the marketplace, and they recruit and enlist the other side of the equation, which are affiliate partners, who are essentially independent marketers that are then responsible for coming up with their own campaigns to drive conversions on that offer. When they do, those affiliate partners are then compensated by the advertiser and paid commissions for that. They’re using their own resources, their own skills to drive conversions on offers for advertisers. Ander: And online affiliate marketing has been around since, what, 1996? Sean: It’s been around longer than that, but 1996 is a good year because that’s actually when the largest and most successful affiliate program started, which is Amazon. Amazon has about 2 million affiliates, or somewhere in that ballpark range, participating in their program. They’ve done a tremendous job building their program. Obviously, Amazon is really, really hot right now. It’s the company that everybody is talking about, and their affiliates have played a large role in helping them build their brand and sell their products. Ander: That is really interesting. And, I imagine, pretty much any time you click on an Amazon link when you’re not actually on the Amazon site itself, it’s likely you’re clicking on an affiliate link. Sean: Yeah, that’s very, very possible. It’s definitely possible that when you do click on a link that you’re buying through an affiliate link. Ander: So, here at Instapage, what does that mean for your job? What do you do on a day-to-day basis that facilitates the success of our affiliate program that we have here? Sean: I run our affiliate program. Instapage is fulfilling the role as the advertiser, which I mentioned earlier. We obviously have a product that we’re looking to bring into market and sell to the market, and so I’m participating on the side of the advertiser. When I look at my role, I’m looking to then enlist and recruit and nurture and help support our affiliate partners to be able to bring the Instapage product into the market to help us sell the product and generate revenue for the company in the form of more customers. My role is basically to help those people do that and support them in doing that and pay out the commissions and give them the tools that they need to be successful. Ander: So, you’re like the first point of contact for all of our affiliates? Ander: Got it. So, there are two different components to this conversation that I would like to focus on. The first is running the affiliate program when you’re in a company, and you have an affiliate manager or somebody who is taking the lead on that component of your marketing. And the second is actually being an affiliate yourself. I’d like to start with the second. Sean, I know you’ve had a successful affiliate career, without getting into all of the details. But my first question for you about that is, what got you into affiliate marketing? Sean: That’s a good question. I kind of actually stumbled upon it back in around 2008. I was really interested in being able to generate income online, so I started a blog and started doing really well in terms of ranking high in organic search results. Google made some changes that affected my business, so I got more into the paid side of affiliate marketing, and I think that’s a good thing to point out as well. There are a lot of different types of affiliates out there, especially right now. You have affiliates who are traditional media buyers—people who essentially buy traffic, send that traffic to a post-click landing page, and help advertisers convert that traffic into paying customers. Those are the traditional media buyers, but then you also have a lot of people who are looking to monetize their blogs. There are so many blogs out there right now. They are essentially doing product reviews, and when somebody clicks on a link in that product review, then they earn a commission on the sales. You have people on YouTube who are recommending products. Affiliates are participating all throughout the funnel, from the awareness phase and consideration to building preference, so it’s really interesting. Again, when I got my start, it was on the blogging side and basically participating in driving organic traffic to my blog and then being able to monetize that traffic. But then I’ve also done a lot on the paid media side as well and being able to buy traffic at a good price, optimize the campaigns, track everything, and then monetize that traffic in the form of affiliate commissions. Ander: How much of this paid media or paid marketing in general is using platforms like Facebook, AdWords, other PPC, or other platforms like in that realm versus maybe a direct media placement that might be based on CPM? Sean: I would say, generally, most affiliates are buying traffic from some source. Google AdWords has been popular for a long time, and now, Facebook is really becoming quite popular with all of the specific targeting that you’re able to do. It really depends on what kind of offers you’re running. For example, in affiliate marketing, there’s something called “pops,” and those are pop-ups that have become really popular and kind of have had a resurgence based upon the popularity of mobile advertising. In that case, you’re buying traffic from a source like Zeropark or some other traffic source. There’s a lot that’s going on on the paid media side in affiliate marketing. I mean, these are people who are doing very well on affiliate through paid media are really skilled media buyers. They’ll buy traffic and optimize campaigns based upon whatever they can do to make money. I know that you were just at a big affiliate conference in Europe—what conference was that? Sean: It was fantastic. I attended Affiliate World Europe in Berlin, which is an amazing city. I really enjoyed my time there. Sean: Yeah. There are a lot of bicycles. I thought we had a lot in San Francisco, but Berlin definitely has more. So yeah, Affiliate World Europe was a great conference. It’s really great to get out there and be able to meet people from different traffic sources. Facebook had a great presence there. A lot of affiliates I got to connect with as well. I kind of learned what is happening in the industry and reconnect with people. it was a fantastic conference. Ander: What would you say was one of the big takeaways from that conference for someone who is an affiliate marketer? Sean: On the affiliate side, I would say the big takeaway from the conference really is a lot of focus was placed on the popularity of using Facebook right now. Again, it goes back to just how popular the platform is, how granular you can be reaching customers, and the specific targeting that you can do. That was a big takeaway. Another takeaway is the popularity of something called “native advertising.” If you’re not familiar with native ads, they are essentially the ads that you’ll see on, say, a publishing site, like CNN or some other media source, and they look like other articles. But when you click on them, they’re actually advertorials. So, they send you to an advertorial. The purpose of them is to sell a product. Those are really, really popular in the affiliate space right now and being able to use those to generate sales and earn affiliate commissions. Obviously, a lot of what we’ve talked about so far as an individual affiliate and selling the product on behalf of the company, marketing the product on behalf of the company, etc., applies also to the affiliate program that a company is using to get their product out there and have affiliates market the product for them. What would you say are some of the unique things about that? I think that when a lot of people think about affiliate, they think of the people who are doing the actual affiliate marketing. They don’t necessarily think as much about companies using that as a channel. Sean: That’s a great question. I like to joke that affiliate marketing is kind of a black sheep, but a lot of companies are realizing that it’s gone from black sheep to golden goose just because of the high return that the affiliate program can produce for a company. It’s an incredibly efficient channel because you’re only paying based upon performance, so if you’re able to set an effective affiliate program and an efficient affiliate program, it’s a really great opportunity for the company to be able to drive more revenue through another marketing channel. Ander: And there are tons of different kinds of companies doing this. It’s not just e-commerce or anything like that. We’re a software product here at Instapage, and we’re doing it. Are there any companies or agencies that are especially well-suited to affiliate marketing? Sean: I would say that in terms of setting up an affiliate program, you’re not limited based upon industry or based upon vertical. It’s more dependent upon which industry or which vertical you’re in with how you set up the affiliate program and how you compensate for affiliates. For example, if you’re in retail, and you’re a company like Amazon like we talked about, or if you’re a big retailer like Nike, if you’re FitBit—all of these companies have affiliate programs, so they’re compensating their affiliates based upon the sales that those affiliates make. Whereas if you are in an industry or if you’re a company where you have a longer sales process, and you want to leverage an affiliate program for more lead generation, where you compensate your affiliates based upon the leads they produce, that’s another way. It’s really about taking a look at what your sales process is, and what you’re looking to achieve with your affiliate program, and then structuring it in a way that helps you achieve your business goals. At the same time, you need to make sure that your affiliate partners are compensated for their efforts. Otherwise, you’re not going to have very many affiliate partners! Ander: Haha. Yeah, that’s right. That’s really the case of why companies need someone who is going to really own that. It’s not some channel that you can just kind of throw out there and automate it entirely. Sean: No, it’s definitely not. There are a couple of different ways of running an affiliate program. One would be to hire an outside company. There are a lot of affiliate networks out there, and they will help you set up your program, help you recruit and enlist affiliate partners, and give out the creatives that you provide to affiliate partners. All of those things. But the other side is having an in-house program like we have at Instapage. There’s a lot of work that goes into having an in-house program because you have to think that you’re trying to empower and enable a team of people—quite a large team. We have thousands of people participating in our Instapage affiliate program. You need to be able to enable these people to be successful, and there’s a lot of work that goes into that. If you’re a company that’s looking at setting up an affiliate program, it’s a really big decision in terms of “Do you hire an outside affiliate network to do the program, or do you build it in house?” And if you do choose to build it in house, just know that you’re going to have to devote resources to doing that because it takes a lot to get it going. Ander: I think a lot of people might assume something… And maybe I’m wrong. I apologize if I am wrong. But, it’s possible that people might assume that you work in a silo. I know you do a lot of work on your own, but you are also very integrated into a lot of the other campaigns, a lot of the other channels that we’re working with here at Instapage. Can you talk about that a little bit? When we’re doing a launch when there is a new feature coming out or some new component of our product (or whatever it might be), where does affiliate fit into the rest of that campaign planning? Sean: Absolutely. Earlier, I talked about affiliates participating across the funnel. The affiliate channel participates in a lot of different ways. We also talked about how affiliates come from different backgrounds. You have your affiliates who are paid media buyers. You have your bloggers. You have what’s become really popular in terms of influencer marketing across social media. We have all of these channels at Instapage. Because our affiliates are spread across all of these channels, my role is really to participate with all of the internal channels as well and make sure that the message that’s going out to our affiliate partners—and the message that they’re putting out into the market—is reflective of the message that Instapage wants to put out into the market as well. We have certain guidelines at Instapage, and I think that’s another advantage of an affiliate program. Not only does it have the capacity to drive more revenue into a business, but it also has the capacity to be able to help spread the message into the market and create value that way. There’s also a promotional aspect to it. When we run a campaign at Instapage, I do play an integral part in making sure that the messaging that we’re putting out there as a company is also the messaging that our affiliate partners are putting out there as well, so everything is seamless across the market. Ander: How do you deal with it when there’s an affiliate partner that is using an inaccurate value proposition or something like that? Sean: That’s a good question. I work really, really hard to build relationships with our affiliate partners, so a lot of them are extremely responsive, and they want to be successful because they’re using their own time and their own resources to market Instapage. If they’re putting out a message that is not in line with the message that Instapage is putting out, their campaigns are probably not going to be as successful. When you think about it from the affiliate side, I’m trying to empower them to be successful in their campaigns, and they’re going to be most successful when their message resonates with the message that Instapage is putting out there and when they’re targeting the types of customers that we want to bring in to Instapage that are providing the most value, because then the affiliate is going to be compensated best, and their campaigns are going to be the most successful. Ander: It seems that one of the most important things about having an affiliate manager working internally at a company is maintaining and facilitating those relationships. Sean: Absolutely. I think it’s another bonus of having an in-house program as well, and it’s something that I really enjoy about my job here at Instapage. I really get to participate across the entire company because not only do we have affiliate partners who are just driving sales or just promoting Instapage, but we actually have a lot of affiliate partners who are using Instapage. They’re our customers, so it’s kind of a hybrid of a program. It’s half-affiliate, half referral in a lot of ways. Ander: And also, they’re evangelists. Sean: Exactly, yeah! Exactly. I look at my job as also taking our customers and helping to create evangelists out of them and spreading of the word that way. We really have a hybrid program, but it also allows me to get a lot of feedback from our existing customers. And then, we have a fantastic product team here at Instapage who is really engaged with our customers, listening to feedback, so I’m able to relay that feedback to our product team and able to let them understand what our affiliate partners think and what our customers think of the product, how we can improve it and what we’re doing right and all of those things. Ander: Awesome. So, in the context of marketing as a whole and where marketing is going… Obviously, technology is getting better. We’re getting more data. We’re more able to target more specific audiences with unique value propositions. Where do you see marketing going in the future, and how does affiliate marketing fit into all of that? Sean: That’s a big question. Ander: It is! That’s exactly why I ask it. Sean: I’ll try to focus on the affiliate side because that’s what I know best. Sean: On the affiliate side, let’s divide it into two aspects, as we did earlier. You have the advertiser side where you have affiliate programs, and then you have the affiliate side. On the advertiser side, a lot of companies, as I mentioned earlier, are really realizing the value that an affiliate program can bring to the company. They are realizing that there are a lot of tools out there that will enable them to easily set up an affiliate program and be able to create another revenue stream for the company. I think that’s one aspect. I think the other aspect is something that a lot of marketing channels and a lot of CMOs and people who are running marketing departments are struggling with in terms of attributing what channels will bring you the most value to the company. How do you attribute the value that affiliates are bringing across the funnel and all of the different touches that affiliates are generating for a company. How do you track that? I think there’s a lot happening in the space in that capacity and in that regard. On the affiliate side, as we’ve talked a lot about, Facebook is huge right now and I know they’re making a lot of efforts to monetize Instagram, which I think will be really big in the affiliate space as well with all of the influencer marketing happening. There’s a lot happening that is really empowering the individual affiliate whether they are a paid media buyer, whether they are running a blog or whatever they’re doing to essentially drive referrals and earning commissions. There’s a lot happening that’s making it easier for them to be able to do it. It’s making it easier for them to build their campaigns including solutions like we have at Instapage where you can easily build personalized post-click landing pages at scale for different offers that you’re running, from the tracking and being able to optimize your different campaigns. There’s a lot happening in the space that’s empowering affiliates and empowering more people to be successful through affiliate marketing. Ander: Awesome. Well, Sean, I’ve learned a lot during this conversation, and I imagine our audience has as well. This has been really, really interesting hearing from the person that I sit next to at my desk here at Instapage more about the job and more about the channel in general. Once again, thank you so much for coming on. It’s been a real pleasure having you here, and I’ll see you in a couple of minutes! Sean: Thanks! It was a pleasure being here, Ander.